Traboccho- a fishing house on stilts unique to the southern coastline of Abruzzo, Italy. Anyone who has visited Italy knows that the food is more than just pasta and crushed tomatoes, seafood is a very big part of the cuisine in the beautiful peninsula. Well that is an understatement when it comes to Adriatic coast of southern Abruzzo where these odd looking structures called ‘traboccho’ exist. Extending 100 yards or more out into the sea these fishing houses have massive nets attached to what are essential wooden logs that, with a might circular push of a horizontal wooden bar protruding out of a larger vertical wooden post not dissimilar to a Pirates of the Caribbean sail on their pirate ship, are dipped into the Adriatic Sea and remain there for an hour or so until they are lifted up out of the water by the heave-ho of the same wooden bar in the opposite direction and within the netting are many little creatures that inhabit the somewhat shallow waters of this coastline. A traboccho is much more than just a seafood restaurant, it is an aquatic experience. When visiting a traboccho you are enveloped by the sights, sounds and smells of the sea, you become part of the environment and when partaking in the seafood delight you become part of the ecosystem. 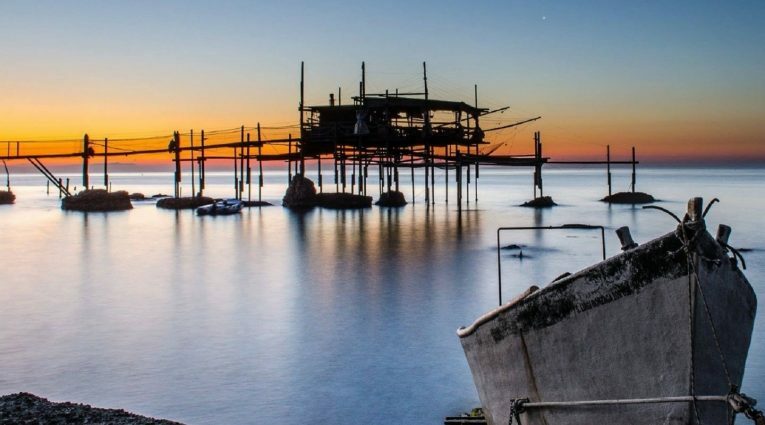 The trabocchi are a time-honored tradition in this part of Abruzzo, so much so that when the earthquakes in this area happen to damage some of these trabocchi they are promptly repaired or in some cases, rebuilt. The skills it takes to work these wooden jewels in the sea have been passed down through the generations of the families who built them. Most of the trabbocho are in and around the city of Vasto, a growing city with fantastic beaches. We visit Vasto during or tour and we have lunch at a trabbacho, it is always one of the highlights of the week.